This is an operation performed in order to remove all of the breast tissue. It is most commonly performed to remove breast cancer but sometimes it can be performed to prevent cancer from developing in patients with a very high risk of developing breast cancer because of their genetic make-up. The procedure is performed under a general anaesthetic. In a simple mastectomy a surgical cut is made across the breast and the breast tissue is removed with most of the skin and the remaining skin is then closed usually with self-dissolving stitches under the skin. 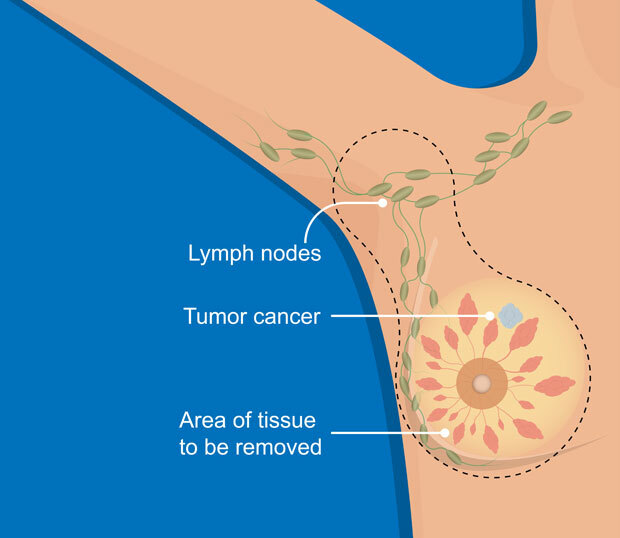 The operation is sometimes combined with partial (sentinel lymph node) or full removal (axillary node clearance) of the lymph nodes in your armpit. You may also choose to have reconstruction of your breast using an implant or tissue from your own body during the same operation or this may be performed at a later date. Usually one or two drainage tubes will be left in place to stop fluid from building up. These are removed after 24 hours or a few days later. After the procedure you will wake up in a hospital room. After mastectomy you may need to spend one to three days in hospital. You are typically expected to go home once you are eating and drinking and are able to manage the pain. It normally takes about three to six weeks to fully recover from a mastectomy and return back to work but it varies from person to person and depends on their general health and the nature of their work. Once at home it is important to get adequate rest and perform shoulder exercises to reduce the risk of getting a stiff shoulder. For the first four weeks you should avoid any heavy lifting or repetitive movements (ironing, vacuuming), avoid swimming or playing sport, avoid driving until you are confident. Mastectomy is in general a very safe procedure. Complications common to all surgical procedures include risk of wound infection, bleeding/bruising, blood clots, heart problems, pneumonia and anaesthetic risks. The complications specific to this operation include short term pain with swelling over the chest wall, a scar, a fluid collection called seroma, skin numbness over the wound or long term pain.